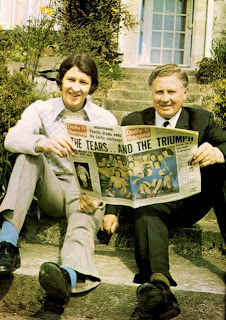 Derek Parlane and his father, Jimmy. The addition of Nicky Clark to the ranks of the Rangers during the summer makes him and his old man Sandy one of the very few Father/Son combinations to have played and scored a goal for the Light Blues. Jimmy and Derek Parlane immediately spring to mind as being another Father/Son duo to do the same, though they also both scored for Rangers against Celtic. Jimmy's only goal against Celtic was the winner in a 3-2 victory at Parkhead in September 1946 whilst son Derek's first Old Firm tally came 27 years later on January 6th 1973 in a 2-1 victory at Ibrox. He would go on to score another 10 goals against them. Whilst the Father/Son connection is a rarity in the annals of Rangers past, you don't have to delve too deep into our unrivaled history to discover that the Rangers Family tree has been blossoming with brotherly love ever since the Club's inception in 1872. As young brothers Moses and Peter McNeil took a stroll through WestEnd Park (now Kelvingrove Park ) in Spring 1872, discussing the new craze of football along with their friends Peter Campbell and William McBeath, they helped plant the seed that has grown into the Rangers we know today. That very first Rangers line up in May 1872 saw four brothers from the McNeil family take to the field on Fleshers Haugh. The Founding Fathers Moses and Peter, along with their siblings William and Harry (Harry played as a guest–he was with the famous Queens Park at the time!) were joined by Peter Campbell's brother John that first Rangers line up which drew 0-0 with Callandar. McNeil brothers Moses and William. That the Rangers Club was such a family affair in the formative years drew criticism from certain quarters. With three McNeils (Harry had continued to play with Queens Park), three Campbells and two Vallances regularly in the team, the claim was that the club was too exclusive. However, the ties of family and friendship meant that the Rangers team had a bond, and they soon started to outstrip the opposition. The original Rangers Family! 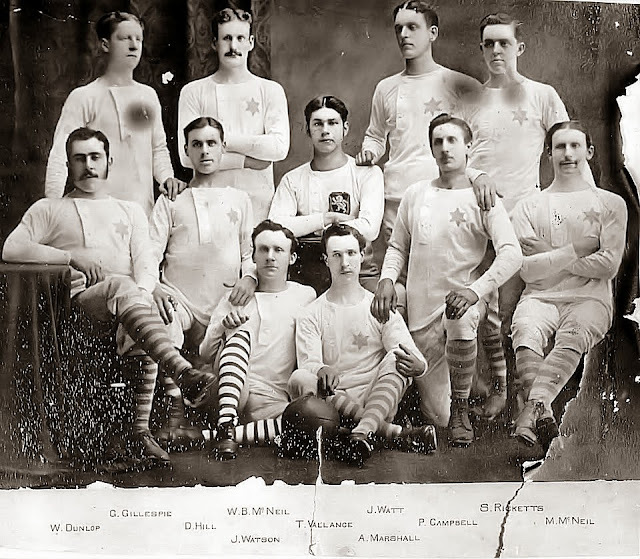 As the Founding Fathers started to become father figures to the young Rangers on the field, the McIntyre brothers were embarking on a career that would make a very marked impression on Rangers and Scottish football. Hugh McIntyre would make his debut in October 1877 in a 13-0 victory v Possilpark, and in February 1878 would go down in history as being a goalscorer in Rangers first ever appearance in England, a 4-2 victory against Nottingham Forest. 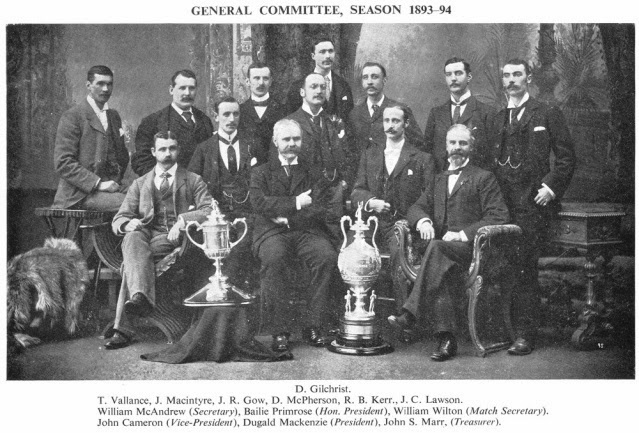 Hugh McIntyre was also part of the Rangers team that won their first ever trophy in 1879, the Glasgow Merchants Charity Cup. 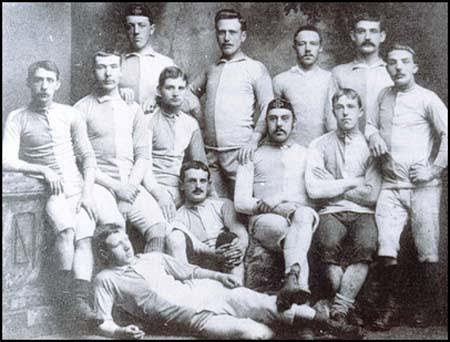 In the 2-1 victory, he was described by the eminent Victorian sports historian H. H. Bone,"'Of all the players sent out by Rangers, McIntyre was in many respects the most powerful. He was however, to be outspoken, the coarsest. Woe betide the light and gentle forward who tried to pass Mr. Hugh. He pounced on his own man at once and meant to have the ball at any cost." It seemed Hugh was a not a man to be messed with! After three years with Rangers, Hugh was lured to England in 1880 by the promise of money, and plenty of it. Blackburn Rovers offered him the chance to play and to become mine host at the Castle Inn in the town. 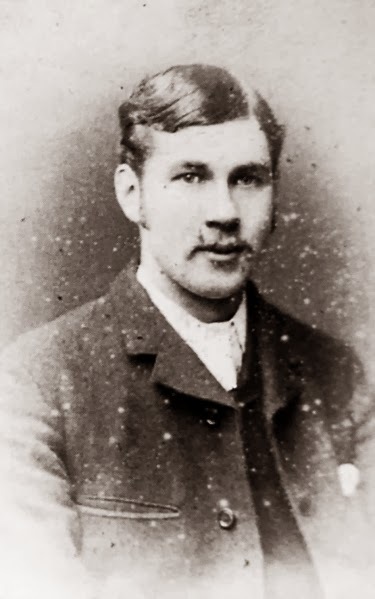 As Hugh would have been contemplating a move to the industrial belt of Lancashire, his younger brother, James 'Tuck' McIntyre, was introduced to the Rangers in April of 1880, making his debut v Dumbarton. The brothers would play together only three times before Hugh the elder moved to Blackburn. 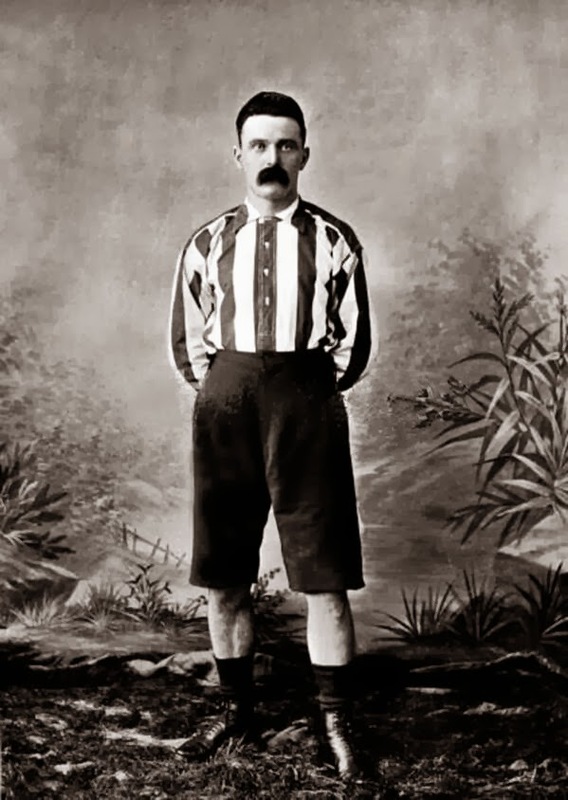 The lack of brotherly love did not prevent Tuck McIntyre from making his own Rangers history: 348 appearances over 13 years saw him be part of the team that played the first ever match at Ibrox on 20th August 1887 v Preston North End, play in the very first Old Firm Match and lift the first ever Scottish League Title in 1891. On the occasion of Rangers very first Scottish Cup victory in 1894, Tuck, by then his playing days well behind him and part of the General Committee, addressed the team, 'Well, boys, you have got the Cup, and I have got the hiccup!' This great Rangers man went on to own 'Tucks' at Paisley Road Toll, which today is the Angel Bar. after the first Scottish Cup Victory. 1886 saw the 'competitive' debuts of brothers Donald and John Robertson Gow. Donald made his debut as an 18 year old v Vale of Leven in April 1886 and would be part of the team that shared the very first Scottish League Championship in 1890/91. His other Rangers claim to fame is that he was the very first Rangers player to Captain Scotland whilst at the Club. Unfortunately it ended in a 5-1 defeat to England at Hampden in March 1888 and would be his one and only Cap. He would go on to play for Sunderland after 8 seasons as a Ranger. On the occasion of Rangers very first Scottish Cup victory in the 1894 Final v Celtic, a Birmingham Telegram Office was handed the message, "Good Old Rangers......Congratulations from Sunderland FC.......Donald." His brother, John Robertson Gow, had a more important role to play at Rangers after his playing days were over. His competitive debut was in September 1886 v Govan Athletic, his 5 seasons at the club would see him make only 60 appearances as a striker. It was as an adminstrator where he would make his mark at Rangers, and would become Rangers President from 1896-98. 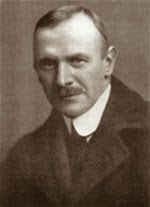 When the Club became a Ltd. Company in 1899, he would be voted onto the board. board after becoming a PLC. The McCreadie brothers had remarkably similar Rangers careers. Hailing from Girvan, they made their debuts in the same match, a 5-2 home win v Hearts in August 1890. Hugh played 196 games as a striker scoring 59 goals whilst defender Andrew played 195 matches, scoring 15 goals from centre half despite only being 5' 5" tall. The brothers also scored in the same match, v Northern in 1892, a 6-2 victory which saw Hugh grab a Hat-Trick and Andrew with a solitary strike. Both men were vital cogs in the first Championship and Scottish Cup winning sides and deservedly take their place as Rangers greats of the 1890s. 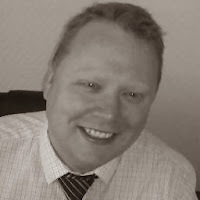 Hugh's connection with Rangers didn't end when his playing career ended. 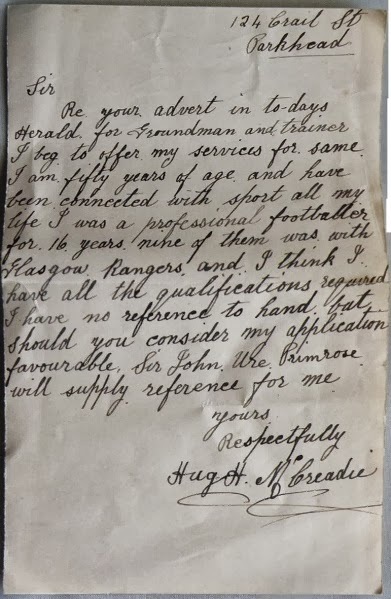 The letter below is his application for position as Ibrox Groundsman when he was well in his fifties, citing Sir John Ure Primrose as his reference. A little known fact is that the great Willie Waddell's younger brother, Walter, was also on the books of Rangers between 1946-48. A first team appearance didn't happen for him, although they are pictured together in this Squad photo taken at Ibrox. Walter did, however, play for Queens Park at some point in the 1940s. 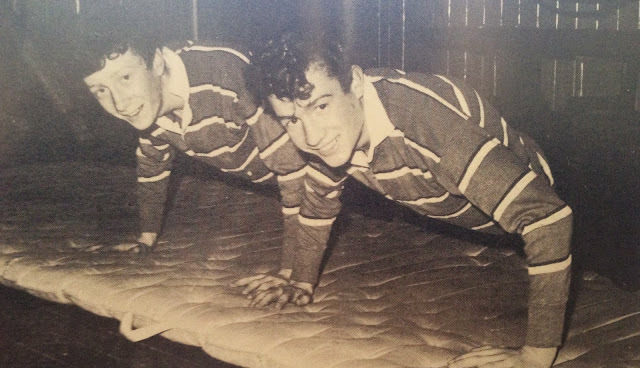 Sandy Jardine was born five minutes ahead of his brother Jamie, time enough, it seems, for him to lay claim to the luck which his twin never enjoyed enjoyed in football. Although Jamie played at Ibrox for a brief spell during the late 1960s his big brother was the one who was destined to make a hugely successful career out of the game. Playing on opposite wings at primary and secondary school, it was Sandy who got the call first from Rangers before it was Jamie's turn to try and impress the Ibrox management during his 4 month spell as a trialist. "I played in the Third team alongside the likes of Alfie Conn and Squeakie ( Alex Miller)," he says in the Sandy Jardine Testimonial Program from 1982. "I was disappointed I wasn't kept on." On being let go by Rangers, he played Junior with Penicuik, but gradually faded away from football. 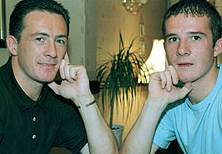 In more recent times, the Ferguson brothers, Derek and Barry, have both been at the heart of a Rangers midfield. Both extremely talented, both had their fall outs with Rangers managers but the success they enjoyed at the club were at opposite ends of the scale. 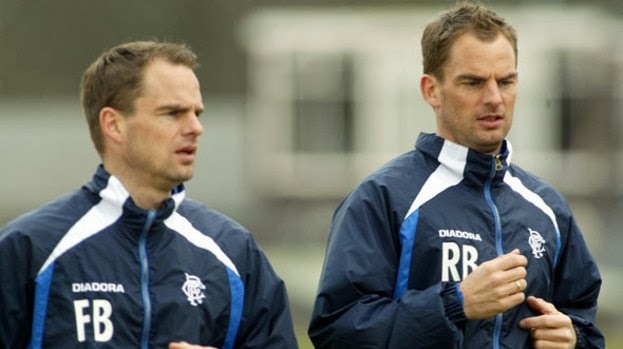 The de Boer brothers were arguably the last real world class players we have had at the club. Frank's visit was fleeting, 17 appearances with 2 goals and unfortunately, a missed penalty v Hibs in the 2004 League Cup Semi Final shoot out. Memories of Ronald are mostly of that one magical season he had when injury free, and of course his 4 goals against Celtic. He was instrumental in the 2002/03 Campaign which saw us win our seventh Treble including the League for the 50th time, and for Ronald his only League Title in his four years at Rangers. One can only imagine the superlatives we would be using in this day and age if the Laudrup brothers had pulled on the Light Blue and stood shoulder to shoulder in a Rangers lineup. Today, however, the only brothers playing a part in the continuing Rangers story are in the Ibrox boardroom. PS, Here's the real John Robertson Gow!